On June 15, 2012, Prime Minister Harper and Michigan Governor Snyder announced the signing of an agreement for a new publicly-owned bridge between Windsor, Ontario and Detroit, Michigan. In January 2004, the Partnership produced a final Planning/Need and Feasibility (P/NF) Study Report, identifying a long-term strategy to meet the needs of the transportation network serving the border between Southeastern Michigan and Southwestern Ontario. To read about this stage of the project, please click here. In May 2004, in accordance with the Ontario Environmental Assessment Act, MTO prepared and submitted an Environmental Assessment Terms of Reference (TOR) to the Ontario Ministry of the Environment for review and approval. The TOR was approved by the Minister on September 17, 2004. To read about this stage of the project please click here. The Partnership has received approvals under the Canadian Environmental Assessment Act and the Ontario Environmental Assessment Act. On the U.S. side, the Federal Highway Administration (FHWA) has issued a Record of Decision approving the U.S. portion of the new Detroit-Windsor border crossing system over the Detroit River. The Record of Decision is the last step under the U.S. National Environmental Policy Act (NEPA) to gain project approval. This web site has been developed to provide project-related information for the Detroit River International Crossing Project. The Canada-U.S.-Ontario-Michigan Border Transportation Partnership (the Partnership) consists of the U.S. Federal Highway Administration, Transport Canada, the Ontario Ministry of Transportation and the Michigan Department of Transportation. To view the current list of meetings and events , and to view copies of recent presentations and handout material, please visit the Canadian Meetings & Events Page or the U.S. Meetings & Events Page. Click on the image below to view the EA Key Study Activities Checklist. Persons interested in this project are encouraged to contact us. A list of the media contacts for this project is available. November 7, 2012 - Statement from the Minister of Transport on the defeat of Michigan proposition 6. June 15, 2012 - Prime Minister Harper and Michigan Governor Snyder announced the signing of an agreement for a new publicly-owned bridge between Windsor, Ontario and Detroit, Michigan. Prepared by Transport Canada and Michigan Department of Transportation, this document answers questions raised by Representatives and Senators of the Michigan Legislature concerning the proposed public-private partnership arrangement for the new Detroit River International Crossing project and the financial liability this could pose for Michigan in the future. It explains the proposed P3 arrangement and how financial risks would be allocated, and addresses the issue of whether anticipated toll revenues could cover future costs, and demonstrates that Michigan would not be liable for any costs for the DRIC project. April 29, 2010 -- MDOT's Report to the Michigan House Transportation Committee, pursuant to Public Act 116 of 2009, Section 384. • the strong bi-national commitment to construct a new publicly owned border crossing that will provide end-to-end connectivity and redundancy for the existing crossings. The Michigan Department of Transportation (MDOT) and Transport Canada (TC) are pleased to present a Request for Proposal of Interest (RFPOI) to individual firms or teams with experience in developing and/or financing large transportation infrastructure projects either in North America or internationally and that are interested in the development of the Detroit River International Crossing Project under one or more public-private partnerships. Individual firms or teams interested in responding to this request (Respondents) are invited, on a non-binding basis, to express their interest in the project. April 24, 2009 - The MOE has prepared a Review of the DRIC EA for comment by the public, government agencies, Aboriginal communities, and other interested persons. Read the Review and the Notice of Completion of Ministry Review on the MOE's website. DRIC Public Forum - The Detroit Regional Chamber is hosting the Michigan Department of Transportation and interested professionals in the finance, construction contracting, engineering/architecture, and legal communities for a Public Forum on the Detroit River International Crossing Project. The forum will take place on April 23, 2009, from 1-3 p.m. at the Detroit Regional Chamber's office located on the 19th floor at One Woodward Avenue, Detroit. Interested parties should pre-register at ASCHROED@detroitchamber.com to receive more information and details on the Public Forum. March 24, 2009 - The DRIC study team has provided responses to MOE for all comments received from public and external stakeholders during the comment period. Please visit the Canadian Reports page to view responses to comments received on the EA Report. January 15, 2009 - The Facts About Air Quality and The Windsor-Essex Parkway. Read more [English] [French]. January 14, 2009 - The U.S. federal government yesterday issued a long-awaited decision approving a new Detroit-Windsor border crossing system over the Detroit River. The Record of Decision, issued Jan. 14, 2009, by the Federal Highway Administration (FHWA), is the final environmental clearance for the DRIC Study for a proposed new border crossing system just north of Zug Island. The Record of Decision is the last step under the U.S. National Environmental Policy Act (NEPA) to gain project approval, following four years of consultations, public hearings, traffic analyses, and environmental studies. The Record of Decision allows Michigan to begin right-of-way acquisition and construction planning for the proposed new bridge. Construction of a new border inspection plaza, bridge and interchange is scheduled to begin in 2010, with an official opening of the new crossing system planned for 2013. Please see links below for further information and how to access the ROD. 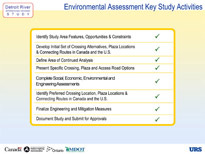 January 6, 2009 � NOTICE OF SUBMISSION OF ONTARIO ENVIRONMENTAL ASSESSMENT - The Partnership has completed the provincial Environmental Assessment for the Detroit River International Crossing (DRIC) study. As required under the Environmental Assessment Act, the Environmental Assessment will be available for public review and comment from Friday, January 9, 2009 to Friday, February 27, 2009. Click here to read more [English] [French]. January 2, 2009 - Detroit River International Crossing Study Team Files Ontario Environmental Assessment Report - WINDSOR - More than 12,000 jobs could be created in the Windsor area if an Environmental Assessment Report (EA Report) files with the Ontario Minister of the Environment December 31 receives approval this year. Click here to read more [English] [French]. December 2008 - The Michigan Department of Transportation has received Federal Highway Administration approval of the U.S. Final Environmental Impact Statement (FEIS) and 4(f) Evaluation prepared for the DRIC Study. The FEIS identifies the Preferred Alternative for a new border crossing between Detroit, Michigan, and Windsor, Ontario, consisting of a road connection from I-75 to a new U.S. border inspections plaza and a new bridge to Canada. The U.S. study team released a Draft EIS for public review and comment in February 2008 and conducted public hearings in March. The FEIS includes responses received during the DEIS public comment period. No sooner than 30 days after the publication of the FEIS in the Federal Register on December 5, 2008, the FHWA will issue a Record of Decision, the next step in the U.S. environmental clearance process. Comments on the FEIS must be received on or before Jan. 5, 2009. Please see links below for further information and how to access the FEIS. Copies of the FEIS are available to view in person at these locations, along with the DEIS and supporting technical reports. Click here to contact the Study Team.